From Hancock County Courthouse drive 0.7 miles west, following Hwy 22 and Hwy 16 to Ghettis Street. Turn left on Ghettis. Follow Ghettis for 0.3 mile as it crosses the railroad tracks, becomes Construction Line, and finally dead-ends into Central. Turn right on Central. Go about 100 feet and where Central turns left, go straight on a dirt lane (called Ebenezer). Either walk or drive down Ebenezer lane for about 200 feet. The lane encircles the cemetery. Some graves appear to be in lots. Graves that are not in any particular lot are listed as lot 0. Those that appear in lots with other graves are marked with a lot number greater than 0. Graves are numbered in the order in which they were surveyed in the cemetery, from front to back. 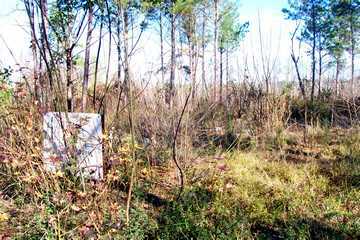 This large cemetery is overgrown and covered in briars. It contains many graves marked with small granite blocks or unmarked slabs. There are also many graves with no markings whatsoever. It is difficult to estimate the number of graves, and graves may have been missed because of the overgrowth. In 1868, Bishop George Foster Pierce (1811-1884), an important figure in the history of the Methodist Church in Georgia, granted a license to preach to Lucius Holsey, a former slave who six years earlier had been married by Bishop Pierce at Sunshine. Holsey became a leader in the Colored (now Christian) Methodist Episcopal Church and had a long and distinguished career. This cemetery, as well as the two other Holsey cemeteries in Hancock County, are believed to have been named in Holsey's honor. 25. A "Sellers" funeral home marker. Age 94. Is in a lot next to the lane. Lot may contain as many as 8 graves. Lot is next to the lane. w/o Rev. J. H. White. Age 45 years. Marked by a small granite block. Marked by small granite block. 3 wooden crosses mark 3 graves. Marked with a funeral home marker. Name unreadable. 8 graves in a group. 2 graves marked with small granite blocks. 3 graves in this lot with headstones or sunken. 6 graves in this lot with granite stones or sunken. "Hers was a life of trust in God." This lot is surrounded by large fieldstone posts and is approximately 40' X 30'. At least 8 graves are within the posts. "Mother" On same gravestone as Oscar Holt. "Not lost blest thought, But gone before where we shall meet." 4 graves marked by granite blocks. Approximately 4 graves in this lot. Approximately 6 graves in this lot. A lot surrounded by a wrought iron fence, approximately 20 X 20. No graves visible. 5-6 graves marked with granite blocks. 5 graves in this lot. Grave predates 1940, when Kimbrough listed this grave in her cemetery listings. Lot on the opposite side of the road from the main cemetery. Room for 6 graves. per Kimbrough list of 1940. Not found in 2001 survey. Age 68. Info and cemetery location per death certificate supplied by Lucie K. Lewis.